The ultimate guide to getting started with blogging! In case you missed it, we just wrapped up our first Teacher Challenge series – 30 days to kick start your blogging! Hundreds of educators from around the globe participated in 8 challenges over the course of four weeks. Together with mentors, bloggers of all experience levels had the opportunity to really step up their game. And if you missed out, it is never too late to work through the challenges at your own pace! 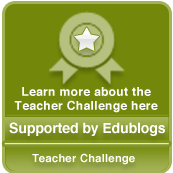 Bookmark or subscribe to the Teacher Challenge main blog to join in! This is truly the ultimate guide to blogging. There is so much to be learnt here – for both those who are new and those who are experienced with blogging. Make time to look at some of the blogger’s outcomes as they work their way through these challenges. There are some great responses, each with more advice and experience shared. The challenge was a wonderful way to learn and take on the learning of new skills. Not only that it was all the things we learnt off each other as we visited blogs. And it has led me into a new field of learning. Joining with others in a webinar on Elluminate. It was a fantastic experience. Thanks Edublogs for running it. Hi Kathryn, glad you enjoyed the challenge! And a huge thank you to Anne for all of her help – especially with the creative way she structured the advanced challenges! Thanks for all of the hard work. I participated in the Teacher Challenge and not only made a entirely new blog for my classroom, I made improvements to my personal travel blog too. I am from the US and am currently teaching in Malaysia although I will be moving to teach in Tanzania in July. Being so far away has been a challenge, specifically when it comes to in-services and trainings, but the web, and projects like this, have made it so much easier for me to find opportunities to improve my teaching on my own. I am looking foward to the next Teacher Challenge! We’re glad to hear you enjoyed the challenge and learned from it. We’re happy too with how it went and hope to put together many more with different topics. Don’t hesitate to let us know if there is a particular topic you are most interested in! That is a very comprehensive guide to blogging. I wish I had that kind of help when I was getting started. It is amazing how much great information there is out there. Thank you for providing this guide. I have been reading this guide and finally feel ready for the challenge. Students love technology, especially a chance to use their smart phone. Now I can give them an excuse to use their phones to talk to me about classwork! are there any challenges like this, for blogs other than teachers and students? I am new to blogging. I’m enrolled in a online ID certificate program. This is the ultimate guide to getting started with blogging. In the Teacher Challenges they range from beginner, advanced, and discussion questions. I’m familiar with Elluminate and Webinar. Blogging will led me into a new field of learning. Thank you for providing this useful guide. Wow! this is really good guide to blogging! It seems you spent lots of time on it, thanks for sharing!